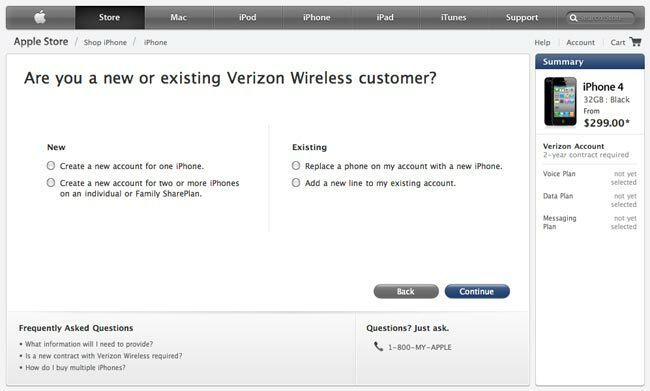 In anticipation of the up and coming launch of the new Verizon iPhone 4 in February 2011, Apple has now made its ordering pages available to the public on its website for both the 16GB and 32GB iPhones. The Verizon iPhone 4 will be available to pre-order for existing customers of Verizon Wireless and new customers will be able to order the Verizon Wireless iPhone 4 from the 10th of February 2011. Verizon Wireless has priced its iPhone 4 at $199 for the 16GB model and $299 for the 32GB model, all of the prices are based on a new two year contract.